Beautiful Incentives: 10 things to keep in mind when choosing an E-reader case. 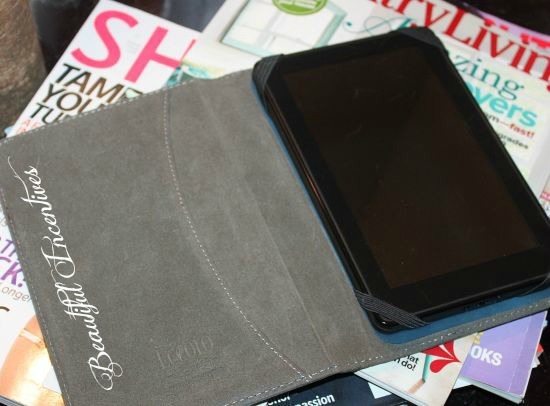 10 things to keep in mind when choosing an E-reader case. One of my favorite and cherished prize possessions is my kindle. It does everything one could really hope for it to do. I read books on it and constantly check my e-mail, update my blog and social media, research and watch videos. When I use my hope diamond of an electronic, I need to make sure that when buying a case, it is the best choice for me. 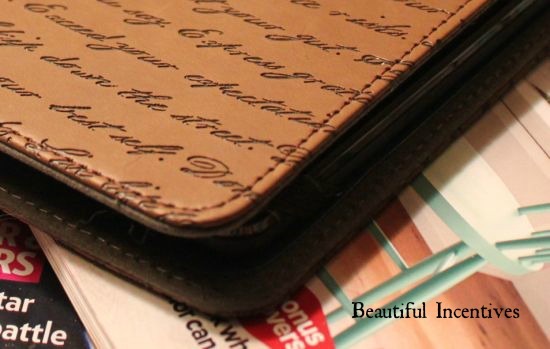 Here are some of the most important aspects to keep in mind when searching for the perfect E-reader case to protect your 'precious'. Always buy a screen cover to prevent scratches and stains no matter what case you buy. The case is added protection. Make sure that the case has a very soft interior, yet is very thick and durable to protect the screen from cracking, scratches and stains. Make sure the material isn't cheap. You don't want it rubbing off on the screen or scratching it. Make sure that the kindle is safely enclosed by the case, whether it's stretch bands, an inner casing, snaps, velcro. Whatever it is make sure that it won't give in on you. Pick a design you really love to reduce the risk of needing to spend more money on another one. There are so many awesome designs out there. Consider where you will be using your kindle. If you tote it around a lot, you may want to get a case with an extra closure for more security. Maybe you are more active and need a case that zippers completely up or you are taking it to the beach where it could get wet. Consider a waterproof case. If you just use it leisurely, then your basic holder is fine. Sizing: Be sure that your device fits the e-reader case. Consider whether you will need some extra space inside to carry a pen, paper etc. Plenty of cases come with little compartments for those things. Research everywhere for the best price. Often times when you find something, you'll find it cheaper somewhere else. Don't settle for less, but do get a bang for your buck. It will be with you for a while. I am a leisurely user and wanted something unique and pretty to look at, but still easy to carry around. The case I chose is the Script e-reader case by Ecco Ltd. This one covered all my basic needs and it's perfect for me. I wanted to preserve the look and feel of a book when I read on my kindle. This has inspirational words in a pretty script on the front and back. I love how easy and convenient it is to read on a kindle, but I also love the tangibility of holding a book. This almost looks as if it is a diary, novel or personal journal, but then low and behold you open it up and the kindle is inside. I love the creative approach to this design. With this cover I get the best of both worlds. This is made specifically in a size 5.5X8 to fit your standard e-readers, so it fits my kindle fire perfectly. The feel of the cover is very soft. 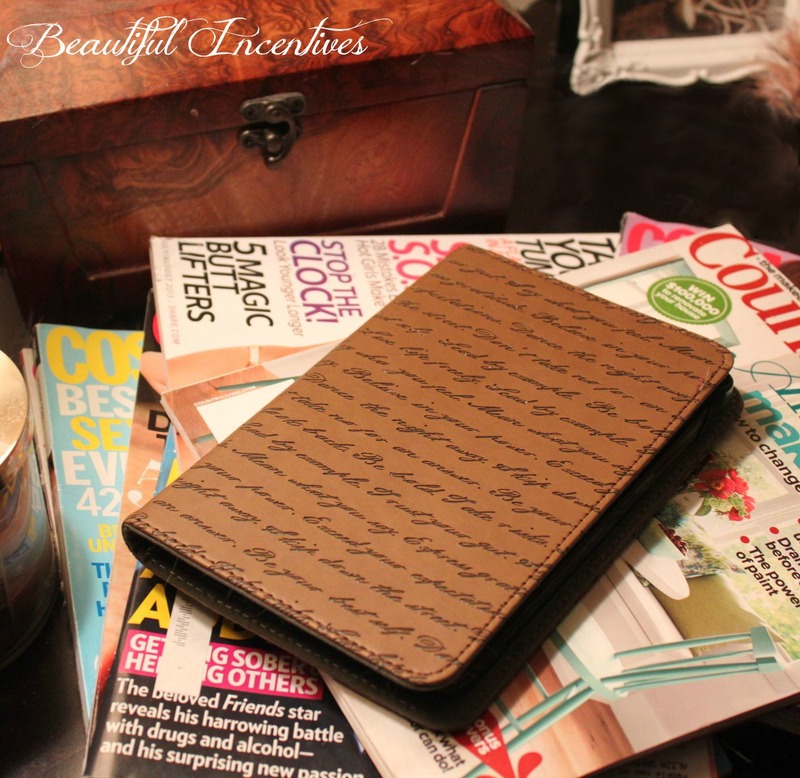 It's well made with a durable faux leather, protecting my kindle fire. The soft lining is easy on the screen and it's held by durable bands on each corner of the kindle. It also includes a pocket inside, which is great for random paper holding. I am so picky about covers and won't stop looking until I find the perfect one. This was it. All I do is tote my kindle to and from a few places a week and use it at night before bed, so I see it lasting quite a long while. That case is gorgeous! I love it and think my mama would too. I am looking for Christmas gift ideas and I think you've just solved one. The cases are so pricey, but they do a great job keeping the Kindle protected. I find $24 with free shipping reasonable for what you get, but there are always sales at Barnes and nobles and other places like Staples. Take advantage of the holidays when you can get more bang for your buck with coupons! I love that case! I need to get an e-reader yet (behind the times, I know), but at least now I know where to check out cases. Thanks!